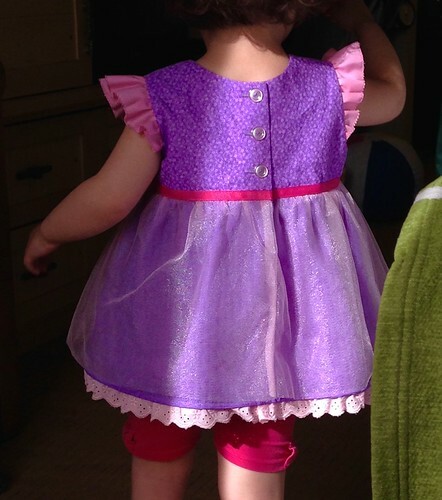 In continuing with my Disneyland princess top and dress sew-athon…My girls had never really seen any of the Disney princess movies other than Frozen. They just were never interested in them, until I made them sit and watch one at a time!!! That sounds awful huh, what a horrible mom. Actually, after watching the Disneyland promo tour videos, they were very excited to watch the movies. 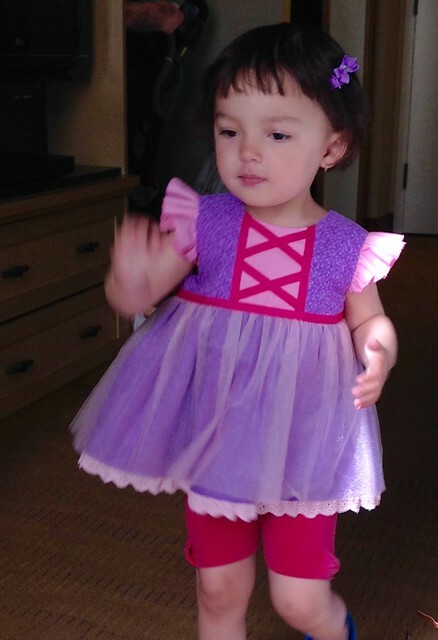 My little one especially loved Tangled, and she requested a Rapunzel dress. Of course mama had to oblige! This dress was actually quite fun to make. 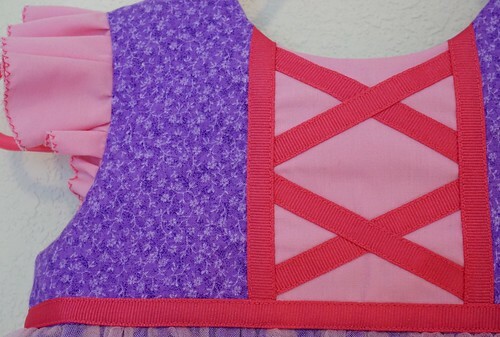 I was loose with the Rapunzel theme, mainly using pinks and purples and a faux corset bodice. I chose Made by Rae’s Geranium Dress because I can sew this up with my eyes closed, and I love the way it looks when worn. 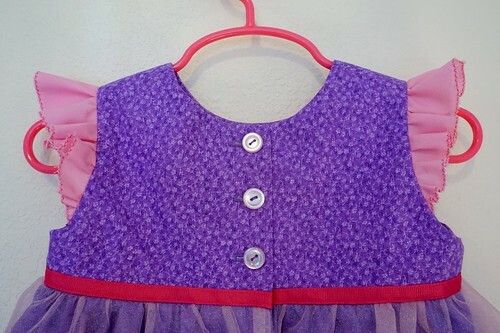 I made the top version in a size 18 months with a bunch of remnant fabrics, pink grosgrain ribbon, and lace trim. The tulle is very soft, and I’m sorry to say shrank after washing it the first time. I don’t recommend this softer stuff for the outside as it just seemed to bunch up and not lay flat; it’s probably better with a finishing stitch at the bottom or as a petticoat. Also, since it shrank like 2″ shorter, I’m probably just going to remove it, and if I’m feeling particularly motivated, add something else. I added the ruffle sleeve option too, using a darker pink thread for the zigzag stitch at the edges. This was my first time adding ruffles, and I really like the way it turned out. Lately my girls are all about the ruffles. Ruffles on everything makes my life easier right now. 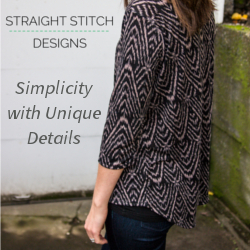 The back is simple, just a few buttons. It’s very easy to get her in and out of. Here’s the full back view the morning of. It was difficult to get pics because they were racing around with franticipation! 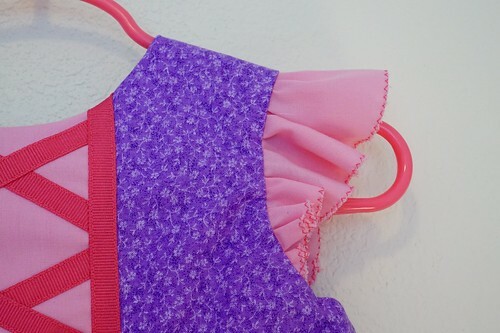 The bottom lace trim was added kind of as an afterthought when looking at pictures of Rapunzel. A little action shot before the tulle shrank! I really like the way this top turned out, and it was very comfortable for her in the heat. The ruffle sleeves not only look cute but protected the tops of her shoulders from the sun too. 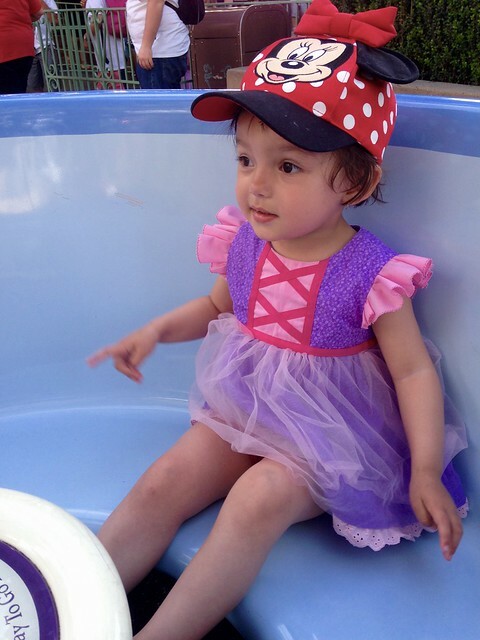 She just loved how girly it was and that it didn’t get in her way of having fun! By the way, are you participating in Me Made May this year? I will for the first time since I have enough me made clothing. I was doing laundry the other day, and the entire basket was filled with handmade clothing! I felt quite accomplished, then realized I hadn’t shared most of them on the blog because they’re mainly wearable muslins (basically not perfect even though I wear them all the time!). There’s still time to sign up if you haven’t! Now off to pick up some baby chicks!